Annmarie Skin Care > Skin Care Tips > What is an Emulsion? 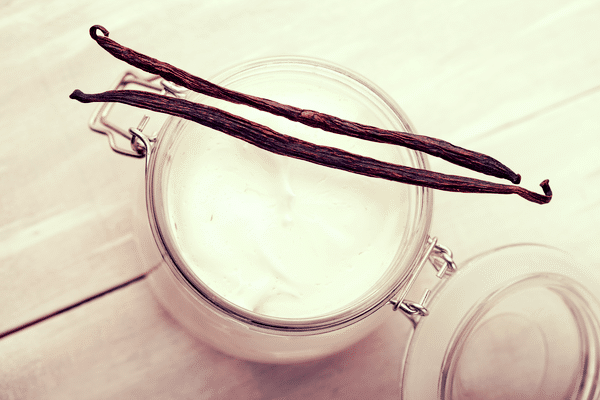 Have you ever tried to make your own skin care cream? Maybe you wanted to experiment with some natural ingredients. There are, after all, many things in your kitchen that can provide a number of anti-aging benefits to your face! Maybe you whipped up some jojoba oil, aloe vera juice, yogurt, and some essential oils. If you applied the mixture to your face right away, you probably sat back and enjoyed the benefits, and then rinsed and went about your day. If you stored the solution, however, and tried to use it later, you may have found something rather strange looking. Maybe some liquid floated to the top and sides, leaving the fatty materials behind. It probably didn’t look right until you stirred it up again. Yet we see water and oil ingredients together all the time in moisturizers, lotions, and creams. How do they get them to mix so well? Turns out it’s simple chemistry—but you don’t have to think of it that way. Imagine that family member who serves as the go-between among members who otherwise would tear into each other if left in the same room. In the world of cosmetics, “emulsion” is a common term. Most lotions and creams are emulsions. Mix two fluids that usually don’t mix together well and you have an emulsion. Think oil and water getting along happily. You can also think of mayonnaise—vinegar water mixed with oil (usually soybean, but we recommend looking for alternatives) whipped into a creamy spread. These mixtures are called “emulsions” because one liquid exists as droplets dispersed in the other. You’ve probably made one at home, if you shook up an oil and vinegar mix for your green salad. Shake vigorously and you can disperse one liquid into the other, but then you have to pour it quickly, before the liquids separate again. Raw milk is another good example. Shake it up and you have a creamy drink. Let it sit in the refrigerator for a short time and the milk fats (cream) separate and rise to the top of the container, leaving the liquid below. The trick is to get these two ingredients to stay blended for longer than a few minutes. For that, we need a third, “peace-keeping” ingredient. What we need is something that can link one ingredient to the other, so they don’t separate. There are several ingredients that do this. We call them “emulsifiers.” In addition to helping the ingredients get along, emulsifiers also create more stable solutions that last longer on your shelf. For mayonnaise, it’s “lecithin.” Lecithin is a fatty substance found in egg yolk that has the unique quality of being both water-loving and oil-loving, so to speak. Imagine a standard cell-phone charger. You have one end that’s designed to fit into your phone, and the other designed to fit into your electrical outlet. An emulsifier is like that. One side of the molecule attaches to a water molecule, and the other surrounds an oil molecule, connecting them together. An emulsifier, in addition to connecting the two types of molecules, also prevents the oil molecules from reuniting with their brothers to form a separate oil layer. The result? No separation. In beaker A, you can see the oil and the water existing in separate layers. In beaker B, the beaker is shaken up, which disperses the oil in the water temporarily. When you set it back down again, however, (beaker C), you can see that it separates again. In beaker D, we added an emulsifier. If you look closely, you can see that all the oil droplets are now surrounded by the emulsifying ingredient (in the red outline), which prevents them from mixing together, and also attaches them to water molecules. Now, the oil droplets remain dispersed in the water, and you can create your lotion or cream or whatever you need without fear of separation. There are a number of emulsifiers we can use in cosmetics. There are those you often see on department store products, like ceteareth-20, PEG-20 stearate, propylene glycol, and polysorbate 20. But these ingredients are often harmful and we recommend natural alternatives. Using a combination of some of the following ingredients allows you to create a nautral emulsifier: beeswax, vegetable wax, coconut palm-wax, borax, lecithin (which can also come from plants as well as eggs), acacia gum, and xanthum gum. You'll find some of these natural emolients in our lotions: Sun Love and Radiant Skin Silk Body Lotion. There are other things to consider when choosing an emulsifier, though. It’s not only about where it comes from and how it’s made, but how well it clings to water or to oil. Sometimes formulators mix several together to create just the right consistency in the final product. In addition to skin care lotions and creams, emulsions are also used to make hair conditioners, sunscreens, makeup products, and more. Check your ingredient lists next time and see if you can figure out which ingredients were mixed together, and with what emulsifier! Have you worked with emulsifiers before? Please share any tips you have with our readers. i’m an estie instructor. thx for the great analogies! this article is very helpful.